I found myself staring into the eyes of a timber wolf. Primarily white with grey markings, it sat on its hind legs calmly watching me. I had first seen a red fox at the mouth of the cave, but in a flash it had disappeared into the brush and trees. So, I ventured deeper into the cave until I reached the innermost sanctuary, which was dark except for the tawny light of a small campfire. After the wolf greeted me with a prolonged and knowing stare, I lay beside its curved form, its fur bristling against the back of my neck. In the dank shadows of the cave, somewhere in the midst of an overgrown woodland, I discovered what American Indians would call my power animal. Earlier, I had first surrendered to the thump, thump of mallet hitting deerskin. Beneath the surface, beneath the veneer of my physical appearance, while I lay on a striped wool rug in Mclean, Virginia, my brainwaves slowed, the electrical frequency known as Theta dropping me deep into a trancelike state. Heavy drumbeats took me on journey that started beside an ocean, that continued to a brook that gurgled over rock, and eventually into the cave that sat high above the brook, hidden in the folds of old oaks and craggy maples. On that Saturday afternoon, in the bowels of the cave born of the dissolution of limestone when ancient underground water once snaked through its crevices, I lay beside the wolf. I soon knew it was time for us to leave. We walked, the wolf and I, to the light at the mouth of the cave. Thump, thump, the drumbeats continued. The wolf motioned for me to climb on his back. I felt his animal warmth beneath my fingers when I clutched at his fur. Soon we were traveling over vast stretches of land, leaving behind the dense trees and hilly landscape until I could see the points of snow-covered mountains in the distance. 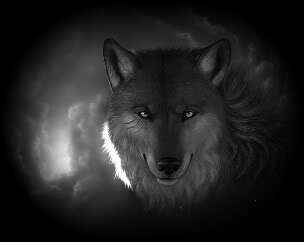 Wind stung my eyes, so I buried my nose in the back of the wolf’s thick neck. We stopped traveling when we arrived in a plain of golden grass whose delicate blades fluttered like golden moths in the breeze. It was here that I dismounted from the wolf and danced with total abandon. When the mallet stilled and the drumbeats receded and silence filled the room, the electricity powering my brain slowly increased, leaving behind the dreamy reality of Theta. It climbed to the relaxed state of Alpha. And when I sat up in the sparsely decorated condominium and collected my thoughts, the charges that sparked in my brain increased to Beta. I was cerebral, returned to my usual intellectual state. The wolf, the journey, the dance, receded from my mind, until the only things that remained were the feel of the wolf’s fur under my fingers and the smell of his hot breath against my forehead, and my first glimpse into the depths of his dark eyes. Sheryl Louise Rivett has worked in business and technical writing, in human resources, and for women’s health organizations. She is the author of Mothers and Midwives: Women’s Stories of Childbirth, an anthology of oral birth stories, which is offered free of cost to midwifery practices, health clinics, and libraries. Sheryl is currently working on two book projects: a memoir, which is a blend of science and personal narrative that explores the relationship between mothers and daughters, evolution, climate change, and multi-generational illness; and a historical novel, which is based on the real life of her great-great-great grandfather, a German immigrant and a Civil War Missouri Home Guard surgeon. Sheryl holds a BIS in Women’s Studies and Communication and an MA in nonfiction writing from Johns Hopkins University. She is currently enrolled in the George Mason University MFA fiction program where she volunteers and writes for the So To Speak literary journal and blog. She lives with her husband and four daughters in Philomont, Virginia.